As I arrived home late this evening I’ve been looking at the latest model runs and found it pertinent to post a quick update. Across the board, models have been shifting snowfall totals up and combined with stronger winds could make for a “Flash Freeze” and snowfall situation similar to what we saw with the storm system last week. 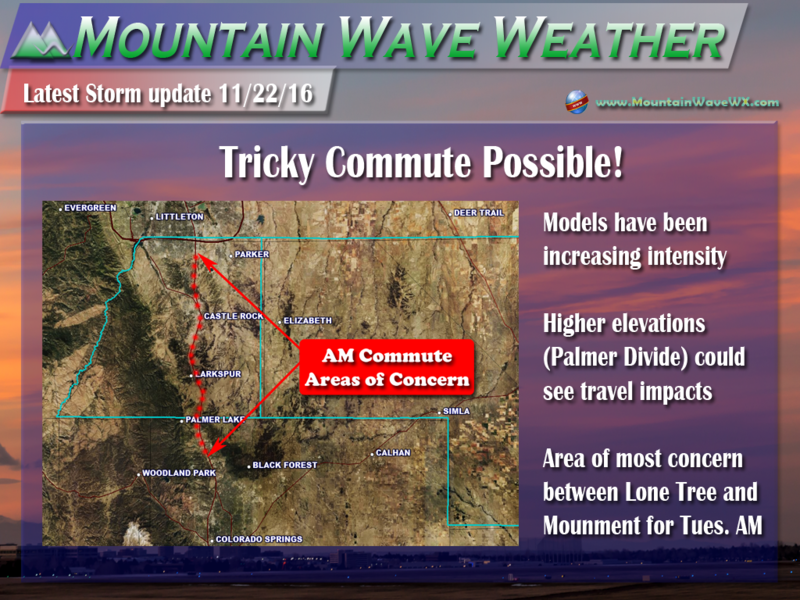 With that, I am concerned the Tuesday morning commute will be pretty tricky, especially for areas South of Denver. HRRR now showing 2.2 inches of accumulation by noon. GFS now shows 2.6 inches of accumulation for the Castle Rock area by noon Tuesday. SREF is on board with snowfall between 2-4 inches by noon Tuesday. Precipitation may start as rain in the late night hours of Monday into early Tuesday morning. Models have intensified the storm a bit so light to moderate snow will be possible in the morning hours. At this time, the best chance for snow looks to be between the hours of 4AM-10AM but expect snow to linger a bit outside those times depending on the speed of the storm. 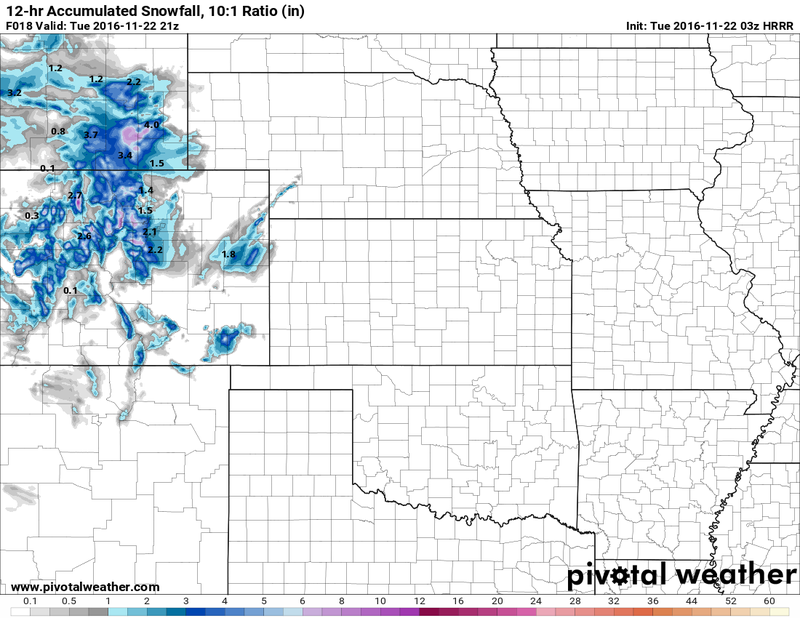 Model agreement at this time is on 2-4 inches of total snowfall by Tuesday mainly along the Palmer Divide. Areas between Lone Tree and Monument will be the ones that need the closest watching. Heavier snowfall could mean the roads ice up at some point making for tricky travel conditions in the morning hours on Tuesday. 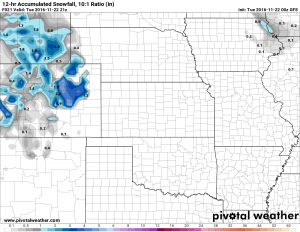 Snow looks to end in the late morning to early afternoon hours on Tuesday. Clearing will be possible later in the day. Temperatures don’t look to get quite as cold with this system so the roads should be ok for most areas in and around Denver. 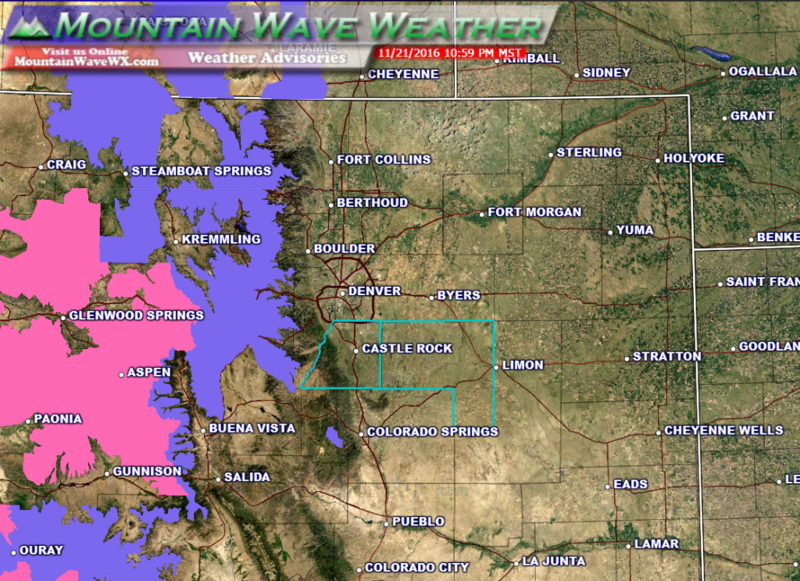 Areas along the Palmer Divide will need to be closely watched for icy conditions. Please be aware of the road conditions and slow down if necessary. If you have any travel plans to the mountains this week, please keep a close eye on the forecast. Several storm systems are set to impact those areas and could cause treacherous travel conditions. * SNOW ACCUMULATIONS...5 TO 10 INCHES...LOCALLY UP TO 1 FOOT. TIMES UNDER THE HEAVY SNOW SHOWERS OR BANDS. * TIMING...THE HEAVIEST SNOWFALL IS EXPECTED TONIGHT AND TUESDAY. * SNOW ACCUMULATION...6 TO 12 INCHES WITH LOCALLY HIGHER AMOUNTS. * WINDS...WEST 5 TO 15 MPH WITH GUSTS UP TO 30 MPH. We will be up early tracking this storm on Tuesday morning. Stay with us or your favorite local weather source for additional information about this storm.